Dooky Chase is a historical and truly wonderful restaurant in the New Orleans Treme district and has been run by family matriarch Miss Leah Chase for the last 41 years. It is one of my very favorite restaurants. Miss Leah is a 96 year old national treasure, full of knowledge and stories and history, far too much for me to go into here. Perhaps you’ve seen her on any number of cooking shows or read about her chastising President Obama for putting hot sauce in her gumbo (“He’s from Chicago, what does he know about gumbo?” Ha!). I’ve met her on a few occasions and sat at that table mesmerized, slowly eating one piece of fried chicken after another, listening to her stories. (Her fried chicken is legendary.) I laughed while reading this recent article in Saveur Magazine as I’ve witnessed ‘the avalanche’ and it is truly a glorious thing. Go to New Orleans. Go to Dooky Chase. Order the fried chicken and gumbo – or better yet partake of the wonderful buffet. Ask if Miss Leah is there. And listen. So anyway, I bought the book the moment I saw the post (because of course I did) and it was waiting when I returned home from holiday travel. This book is a delight, perhaps a little dated (c. 1990) but full of interesting stories, i.e. the Sweet Potato Pone, and even more interesting recipes. There’s the fried chicken, one for Stewed Turtle, two for squirrel, a bunch of vegetable recipes, something interesting called “BLT Soup” and countless Creole dishes that sound delicious. Quite a few recipes call for “Pet Milk”, known these days as evaporated milk, maybe even from the PET Company. Several are cooked in something called a Magnalite Chicken Fryer, which google tells me is an aluminum lidded pan with a black plastic handle typically used to … wait for it … fry chicken. I’m pretty sure everyone’s grandmother had one of these and you can still buy them at Amazon, WalMart or if you want to acquire the actual pan of your grandmother, eBay. I love everything about this though will probably still use my cast iron skillet when needed. 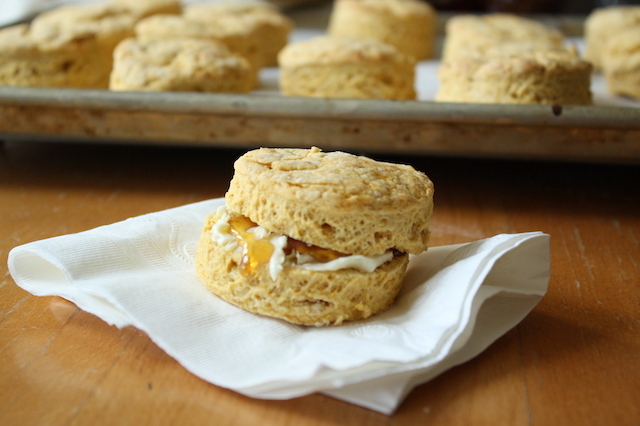 For some reason, the very first recipe in the book called to me: Sweet Potato Biscuits. I don’t know why but I kept turning back to it. Maybe because I’ve never really been happy with my biscuits. Maybe because the addition of sweet potato, though I’ve seen it many times before, intrigued me. Maybe because I thought if anyone was going to get me to make a good biscuit, it was Miss Leah. Maybe because it was a snowy weekend morning and biscuits sounded damn good. So why not start with the first recipe in the book? 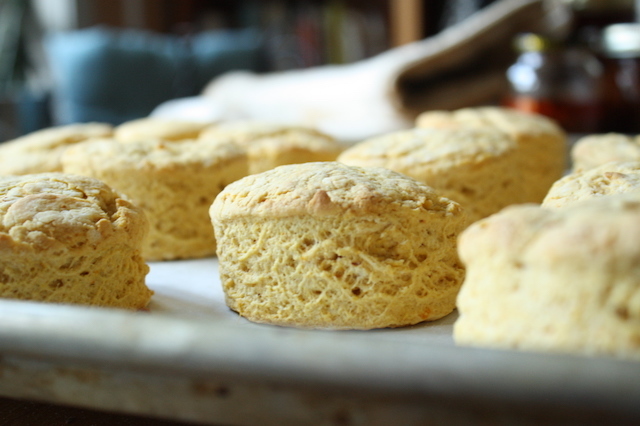 It’s a relatively simple recipe assuming you have self-rising flour, which I found easily enough at my grocery store. I’ve read you can make your own, which I’ve included below, but I went with the commercially purchased stuff. It just seemed right. I used the bit of butter, as called for, though everything in my being was crying for me to substitute the shortening with butter. And I used whole milk while, again, my inclination was to grab the buttermilk. Nope. Miss Leah says a bit of butter, shortening and milk so that’s what I did. Because I just can’t help myself I added a ½ teaspoon of piment d’esplette, which is not even close to a New Orleans/Creole ingredient, but I felt Miss Leah would be ok with this French Basque addition. Well maybe, maybe not. She didn’t like hot sauce in her gumbo after all. The dough came together easily, without any special tools or tricks. I cut the shortening into small pieces first and put it in the freezer to chill while I prepared the rest of the ingredients. I then worked it into the dry ingredients with my fingers until it broke down into smaller pieces, then the sweet potato/egg/milk/sugar mixture was blended in and the mass gently kneaded and turned until no dry bits remained. Though the recipe says to roll to ½” thickness, I went with 1” on a lightly floured sheet of parchment. This whole process, once the sweet potato was cooked and mashed, took maybe 10 minutes. Can we talk about the yield? 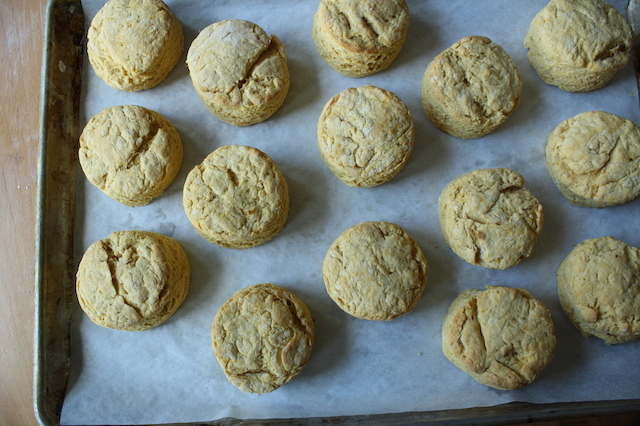 For some reason, though she doesn’t indicate what size biscuit cutter to use, the recipe yield says 6 biscuits. This was a true head scratcher as I used a 2 ½” cutter, a fairly standard size, and got 16 biscuits. SIXTEEN. Nearly three times as many. Just how big are Miss Leah’s biscuits?? Yikes. Each and every one was delicious. A light peachy color, craggy and crunchy on the outside, tender and moist on the inside. I quite liked them! My biscuit game is getting stronger. They can be adapted so many ways – more baking spices for a sweeter take, curry powder and/or nigella seeds would be wonderful, even some onion and sage for a more stuffing-type bend. They would be a great addition to a Thanksgiving dinner and a fantastic use of leftover sweet potatoes for those day after sandwiches. Per usual, I’m right on time with these suggestions so in the meantime, steam up a sweet potato special, just for this, and practice. STRESS THERAPY BAKING FACTOR: BLISSFUL. Crunchy and tender and just the tiniest bit sweet, I ate far too many. I couldn’t help but think of Miss Leah while making these – of her stories, her marvelous food and just her presence. This recipe was a good place to start. Easy enough to knock off in a few minutes on a snowy Sunday morning, tasty enough to eat throughout the day. And the next. Sixteen is a lot of biscuits. These are one of those ‘best the day of’ kind of things but the sweet potato kept these moist and help them hang on for another day or so. A keeper. Preheat the oven to 400°F and line a sheet pan with parchment paper or a silicone baking mat. Cut the shortening into ½” pieces, place on a plate and place in the freezer while you prepare the other ingredients. In a large bowl, whisk together the flour, baking powder and piment d’esplette (if using). Set aside. In a separate smaller bowl, whisk together the melted butter and sweet potatoes. Whisk in the egg and sugar and mix until creamy. Whisk in the milk until well blended. Set aside. Remove the shortening from the freezer, add to the dry ingredients and rub into the mixture with your fingers until its the size of peas. Make a well in the center and add the sweet potato mixture, stirring with a rubber spatula to blend. Once the dough begins to come together, gently knead and turn in the bowl until no dry bits remain and the dough is a soft, cohesive ball. Do not overwork. Turn the dough onto a floured work surface and roll to a 1” thickness. Cut with a 2 ½” round cutter and place biscuits on the prepared sheet pan. 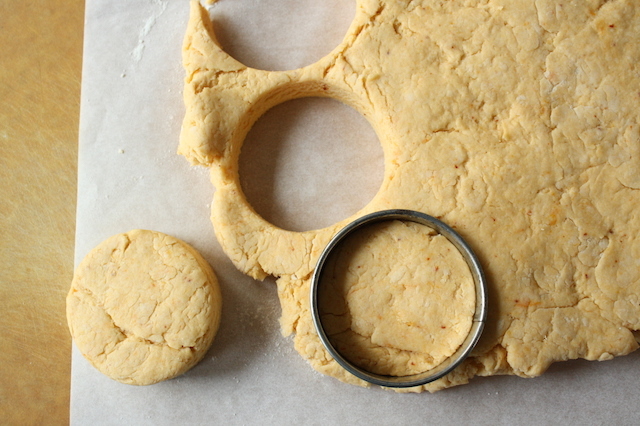 Gather the scraps, gently knead and press into one piece, reroll to 1” thickness and cut additional biscuits. Bake for 15-18 minutes until golden brown, rotating the pans halfway through baking (top to bottom, back to front). 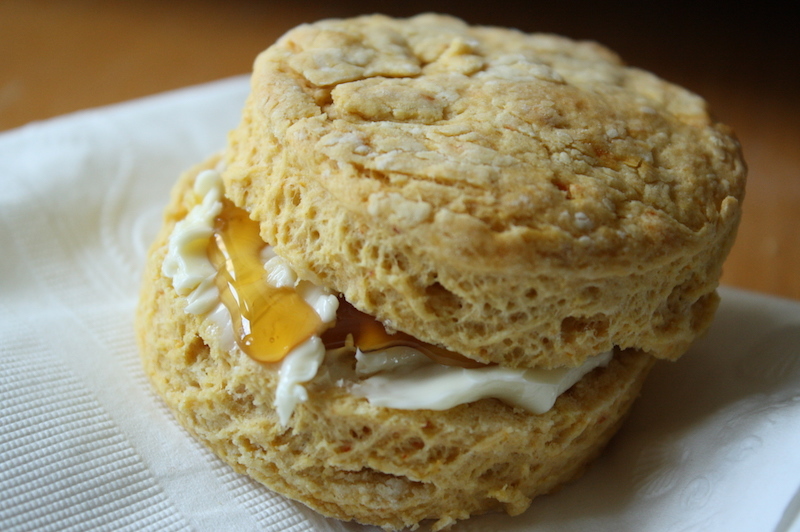 Serve with butter, or better yet, honey butter or even better, butter with Mike’s Hot Honey, while warm. They don’t keep particularly well and are best enjoyed the day of baking. This will make a smidge more than you’ll need for the recipe. Whisk everything together and measure out 3 cups.